Payroll technology is one of the most widely-used tools for companies of all sizes. But there’s still some confusion into what payroll tools businesses need. Is payroll software enough? Are there other tools that can improve efficiency? Payroll software and payroll disbursement platforms are a prime example. While they sound similar, each platform has a distinct use and benefits that affect business costs and liability. Payroll software calculates paychecks based on salary or hours worked. The software integrates with time tracking tools, then determines and withholds taxes and deductions from each employee’s paycheck. Some all-in-one payroll software solutions also include options for self-service and automating payments. Self-service options may include a portal for employees to change withholding amounts, while automation reduces manual payment needs for salaried, hourly, or contingent employees. Automated payments are usually dispersed via traditional check or direct deposit. Most companies implement payroll software to reduce errors and cut down on manual work. Because the software takes care of calculations and, in some cases, disburses payments, there’s less chance employees will be paid incorrectly. What is a Payroll Disbursement Platform? Unlike payroll software, a payroll disbursement platform doesn’t calculate the amount of funds each employee should receive or withhold taxes or deductions. Instead, payroll disbursement focuses on sending money to those who have earned it. But instead of just checks and direct deposits, a payroll disbursement platform lets businesses customize the way payments are made. They can use traditional checks, direct deposit, reloadable card solutions, or virtual payments. Businesses can also use the platform to reward employees for high performance with incentive cards and gift cards. Self-service tools for employees are included in payroll disbursement platforms, allowing each staff member to personalize their experience by selecting the payment method they prefer. Unbanked employees often opt for payments via card solutions instead of checks because they’re more convenient, for example. Since checks are more expensive than card solutions, this saves the business money as well. In addition to saving money by displacing checks, a payroll disbursement platform can reduce payment burdens on businesses. They do this through a SaaS platform that can reach employees remotely regardless of location. Employees also input their banking details directly into the disbursement platform, so businesses don’t have to collect and store as much sensitive information. The biggest benefit of payroll disbursement platforms, however, is regulatory compliance. The best platforms absorb the burden of regulatory escheatment and PCI compliance, so businesses spend less time and money on staying up to date themselves. Payroll software is often considered the first step in the payroll process, where payments are calculated and deductions withheld. Payroll disbursement platforms are the second step that focuses on getting money to employees. Despite the prevalence of both payroll software and payroll disbursement platforms, many companies still rely solely on payroll software. They work within the boundaries of that software, often using more expensive payment methods like checks and shouldering the full burden of regulatory compliance. 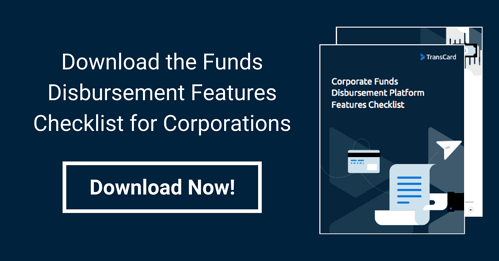 By adding a payment disbursement platform, businesses can resolve these issues, saving time and money with less expensive payment options and reduced compliance needs. The new system not only benefits businesses, but provides a personalized experience for employees, who can receive compensation in whatever form works best for them.